For further details of the species see Crinum erubescens L.f ex Aiton. Crinum erubescens is a largely aquatic, somewhat variable bulbous perennial with numerous long, narrow, curved leaves, and scapes, to 60cm long, bearing umbels up to 12, fragrant white, purplish-red or pink flowers, to 12cm long, in summer. [RHSD, Hortus, Baker Am.]. The variety Loddigesianum has dark purple tips to the flowers. Paxton's Dictionary describes the flowers as white and purple. [RHSD, Baker Am., PD]. For historical details also see also Crinum erubescens L.f ex Aiton. I have found no illustration of Crinum loddigesianum. 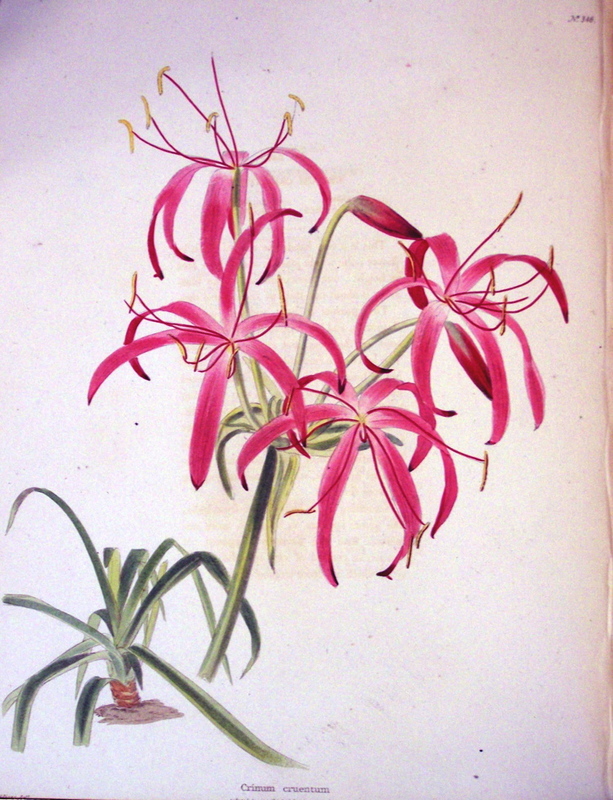 The figure used here is of Crinum cruentum from the Botanical Cabinet [LBC no.461/1819]. 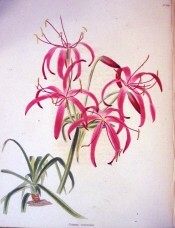 Conrad Loddiges did not include the plant described by Herbert as Crinum loddigesianum in his Botanical Cabinet. Listed in all published catalogues [B.85/1843]. The earlier importation may have been lost as Macarthur included Crinum cruentum among desiderata to Loddiges’ Nursery on 6th January 1845. [MP A2933-2, p.28].